Lots of parents complain that their kids became infested with head lice after attending a crowded rock concert or slumber party. I hate to tell them that one of the more recent causes seems to involve their kids’ smart phones. Young people often crowd together head-to-head to take that funny selfie to post on Instagram, Twitter or some other social media. So, believe it or not, taking selfies is a high-risk activity for getting head lice. In more and more places, professional Lice treatment is now a much sought after service. Lice Treatment Center® has been reminding moms and dads to be the alert for these tenacious critters because one infested person can lead to a full family infestation of lice. The study, conducted by John Clark, a professor of environmental toxicology and chemistry at the University of Massachusetts Amherst, looked at the genes of lice from 32 sites in the U.S. and Canada. Researchers found that 99.6% of those tested in 2007-09 were genetically resistant to the pyrethrin and permethrin based lice treatments currently on store shelves--the chemicals most frequently used to treat lice. The study goes on to say that “Super or not, there are ways to get rid of these creepy critters. For starters, there are a number of home remedies for lice that while time consuming - are more likely than their chemical counterparts to actually work.” The Lice Treatment Center® line of lice treatment and repellent products, are all-natural and non-toxic. They have been successfully field tested on over 200,000 LTC clients. As the article stated, there are professional lice treatment services that will do the painstaking work for you. 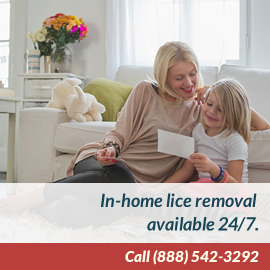 Lice Treatment Center® a national, in-home service is consistently praised for its efficacy can be reached at 1-888-LICE AWAY/1-888-542-3292. How Have “Super Lice” Changed Back To School Season?